Lee Chilton shows the kind of tenacity which makes him such a crucial part of Paul Holleran's promotion-chasing side. Leamington boss Paul Holleran says fans expecting his side to waltz to the Southern Premier League title on the back of a brand of flowing football are misguided. Brakes moved into top spot in the Southern Premier League on Tuesday night courtesy of a 3-0 win over Slough. And, while Holleran realises he now faces an even tougher challenge to manage supporters’ expectations, he said it was disrespectful to Brakes’ rivals to expect a cakewalk to the title. “The league has gone up a notch. It’s definitely got stronger,” said Holleran. “There’s an element of the supporters who think that we should go into the Southern Premier and automatically win it. “Some of the criticism we have received has been fair, but some has been ridiculous. 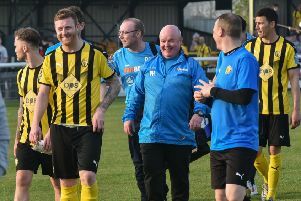 While lacking the financial clout of some of their promotion rivals, Leamington do possess a blueprint for promotion based around their 2012/13 title-winning season. And according to Holleran, that means identifying players with the right attributes to stand up to the demands of an arduous, and varied, campaign. But it also allows them to express themselves when the opportunity arises. “To build a side to be successful in this league you’ve got to be able to do a bit of everything,” Holleran continued. “We can’t just bring in players who are the finished article to win us the league. “We need players that can cope with Tuesday and Wednesday nights at places like Cambridge, who can cope with sides that want to play but also with the physical side. “We need to be able to grind it out, but when we get a chance to play, play. “We’ve got the experience of last time in the division and that’s one of the reasons we brought Lee Chilton back. Seven points from nine have helped lift the gloom that followed the FA Cup exit at Stamford and the subsequent fallout from Liam O’Neill’s removal as assistant manager. However, ahead of tomorrow’s trip to Frome, Holleran said it should be appreciated as a good start and nothing more. “We’ve started the season well. We’re in the pack. I feel we can be competitive but there are still over 100 points to play for.  Brakes home league fixture against Cambridge City has been rescheduled to Tuesday, November 3 (7.45pm).